We all have them: our own personal finance vices, our bad money habits. No one can be perfect all the time, and we’re all subject to giving in and spending a little more when we know we shouldn’t, or getting a little lax with tracking our spending and budgeting down to the last cent. Some of the excuses we use to defend our bad money habits are just lame. Yet we’d rather make these excuses rather than face reality and make a plan to change our behavior. It’s these excuses that we need to bust today, because these are the ones that are holding us back financially. Here are some of the most common excuses I hear people give for their bad money habits – and why we need to stop making them. Never a better time than now to learn, then! Don’t let a lack of knowledge hold you back financially. Use your favorite personal finance blogs as your own personal money Google: go to a blog you enjoy and type your question into the blog’s search box. See what kinds of posts pop up. Bloggers are just one place to start (and I say we’re a good resource because that’s what we’re here for — to share our knowledge and what we’ve learned with others). If you need big-time help, don’t hesitate to ask a professional. Ask a financial planner who is willing to be your fiduciary your most pressing questions. Don’t forget to do your own research, too. It’s up to you to make sure your money is used in the best way possible. Wrong. Time is the most powerful factor in determining a high-value nest egg down the road. Starting now is going to make things WAY easier on you than waiting until you’ve decided you’re “old enough” to be concerned about your financial future. To be fair, for some this may be reality rather than just an excuse. But for the majority of us who are lucky enough to live in a country of abundance like the USA or Canada, it’s likely just something we say in an effort to avoid the real problem here: you don’t have enough money to buy all the stuff you want and save some too. Do you really need all that stuff? Do you really use all the services you pay for each and every month? Cut the extra and learn to prioritize your spending. Your money is valuable stuff because it can be used to make more money when you invest it and allow compound interest to do its thing. Make sure anything that goes out for a purchase is bringing home something you value just as much if not more than the ability to increase your wealth. Not true! Don’t discount yourself like that. You’re a smart, talented, and capable individual who does have the power to increase earnings and income. Negotiate a raise at your job. Consider (if you truly need to make a change) searching for a new, better, and higher-paying position elsewhere. Start up a side hustle. Start your own business. I Can’t Invest Now — All the People on the News Have Been Freaking Out about the Market! If this is happening, then it is the perfect time to invest. Remember the wise words of Mr. Buffett: be fearful when others are greedy and greedy when others are fearful. But ultimately, a better piece of advice might be don’t try to time the market. Making steady, consistent contributions to your retirement account over time will earn you the greatest amount of wealth when you need it most. Besides, when the markets do go down there are now a number of easy to use online trading platforms (such as this one) that beginner retail traders can use. Again, it’s all about compounding interest! Your 401(k) is not fun money. It’s for your future and you should never think of it as a great source of cash when you need it fast. Unless your arm fell off and you need to pay for a new one, there’s really no situation where you need to borrow — or worse, empty — your 401(k) account. Compounding interest can’t work for you if there’s no money in your account to compound over time. Didn’t you just read about how your arm could fall off?! Of course you need an emergency fund. We all do… unless you have a crystal ball that can predict when things are going to go unexpectedly wrong at the most inconvenient time. An emergency fund exists to protect your and your finances when an unforeseen expense pops up that must be taken care of, pronto. Do yourself a favor, stop making the excuse, and start establishing one now. 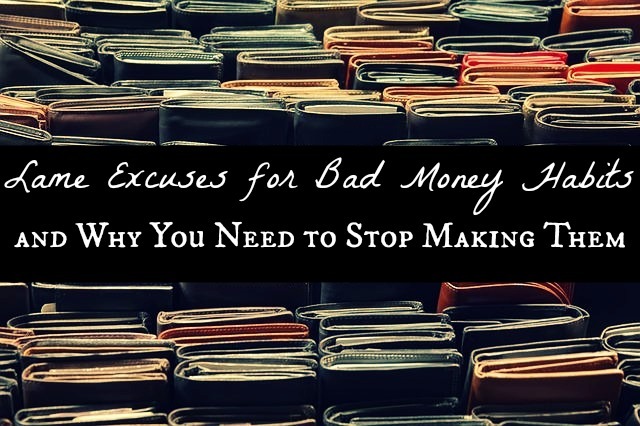 Are you guilty of making any of these excuses for your bad money habits that are holding you back financially? What are some of the worst excuses you’ve heard? Thanks, Catherine! I appreciate it 🙂 I agree, we tend to go with the path of least resistance, and managing money can be hard work — if nothing else, because we constantly have to fight temptation (or at least, I know I do). I think the most disturbing one for me is when someone says they expect to get an inheritance or money from their parents. Not only are they not doing it themselves, but what if that family member outlives their money? You may end up having to help them. Be more prepared. Be personally responsible. Good point, David! That might be the worst of the bad money excuses, and the height of entitlement. While an inheritance can certainly help someone out, it should never be expected or relied upon. I agree — we need to be personally responsible for our personal financial situation. Exactly! It should be a surprise. You’re so right on the “I’m too young to worry about retirement.” I used that excuse for two years and now I’m paying for it now that I’m self employed and have no 403b to buy in to! Your hit all the key points in your article. I’m linking to it in my monthly newsletter. I don’t think many people in their early 20s outside the PF world are worrying about retirement (at least my friends aren’t). It’s just not on their radars, which is sad. Graduating and finding a job are priorities, and I think it gets lost in the shuffle. Additionally, most of my friends are still living at home, and I think they assume they have no need for an emergency fund because their liabilities are low and mom and dad will pay for things. People continue with these beliefs for too long. I’ve found the same thing, E.M. – most of my friends outside of the PF blogosphere aren’t really concerned about retirement or even thinking about it. It’s sad and a little scary! I’m attempting to instill in my teens the information I unfortunately didn’t discover until my early 40s. In our 20s we thought we were oh so on top of things because right from the start we saved the recommended 15% for retirement. In hindsight the gapping hole in that plan was that we accepted the recommendation and never questioned it. Sure 15% is great. It also means you’ll be ready to retire in 43yrs at 65. Given all the possible ages in the world to retire (or be financially independent and work only by choice) would you choose 65? I know I wouldn’t have. How about 50? 40? 30? All are possible if you have the simple math required and more importantly know about it BEFORE you commit to a spendy lifestyle (giant mortgage, multiple car payments, multiple kids in daycare etc) that will trap you into paying off debt of various sorts for several decades and staying in a job you may not love simply because you need the income. My kids may still decide to go the traditional route and only save 15% and retire at 65, but at least they’ll choose that path knowing they had other options. By upping our savings in our 40s we’re now going to retire in our mid 50s rather than 65, but it’s annoying to realize now what could have been. I guess the good news is if you get serious even at 45 you could still retire at 52 styestyle changes. It may be difficult to convince a new grad to save 50% of their take home pay, but avoiding a high spending lifestyle from the beginning is much easier than paying off massive debts in order to free up money to save. A two income household can just live on one and save the other. Once you reach financial independence you may decide you still love going to work everyday and that’s great. Won’t it also feel better knowing if anything changes you have the freedom to walk away? I don’t suggest anyone retire to their rocker at 30. Far from it. Being financially free just means you can pick and choose what you fill your days with and how much you want to work/volunteer/enjoy life. Hey JMK, I think the same thing: figuring out when YOU want to retire is just simple math. I get so tired of people complaining about their job, pay, schedule, etc when they could do something about it. I understand that not everyone has this epiphany at an early age but when you do have it, it’s up to you to do something about it. I was fortunate to have my ‘savings epiphany’ very early on and because of it I’ve been maxing out 401(k), HSA and Roth since I started working 5 years ago plus saving 10-20% of my pay in cash (and investing in RE) and in another 3-5 years I will literally be ready to retire haha. I mean I probably won’t since I’ll only be 32 or so but I at least have the option to pursue other passions which is more likely what I’ll do. You have a great point. I finally now realized that I have to save more because I tend to buy what I want. I don’t know but I feel not contented if something that I really wanted to have is I can’t get. Thanks for sharing. I learned a lot. For years, I lived without a money plan. BIG MISTAKE! After getting married, my money management skills vastly improved. I realized that I need to budget for everything, and not buy all this material stuff. I learned to live without the unimportant stuff. Of course, there are things we do splurge on – healthy foods and workout clothes – but we keep it reasonable. Those sound like great things to splurge on! There’s nothing wrong with spending so long as you’re taking care of your financial responsibilities as well — and ensuring that that spending aligns with your values. Kali, these are some really good advices. I should pass them to my work colleague, who always complains that he has no money, but buys these weird and unnecessary stuff, just like you pointed out in “I Don’t Have Enough Money to Save” paragraph. I think most people just want to take the easiest route in life and thats following the crowd and getting caught up in the web of consumerism and let themselves be controlled by money. I think you’re on to something there.. the easiest route is definitely tempting. But the harder route is far more rewarding and will set you up for stronger financial success! How about the “Why would I struggle to save now when it will be so much easier once I earn more in a few years?” It’s similar to the “I don’t have enough money to save” but seems like a “better” excuse given that a person is working towards climbing the corporate ladder — a responsible endeavour. It might be ok, but only if that individual truly intends to keep spending at the current level and start saving the extra income. Sadly, I have rarely seen that behaviour pan out in people how don’t already have a savings mentality. It’s definitely a bad excuse — because time makes all the difference when it comes to investing! You’re better off saving less and starting now than trying to throw a bunch more money at your investments later.